Matthew Caws is one of the five biggest songwriting inspirations of my life. Nada Surf music is a joy to listen to, and so are his side projects. Their music has elevated my tastes, enjoyment of music, and Matthew's ability to transform energy of a mood is very restorative for me, personally. It's my honor to present a very enjoyable conversation with a peek into Nada Surf Rehearsal recording, songwriting, meaning of music, and how we can be more kind to one another. Enjoy my interview with Matthew Caws from Nada surf. 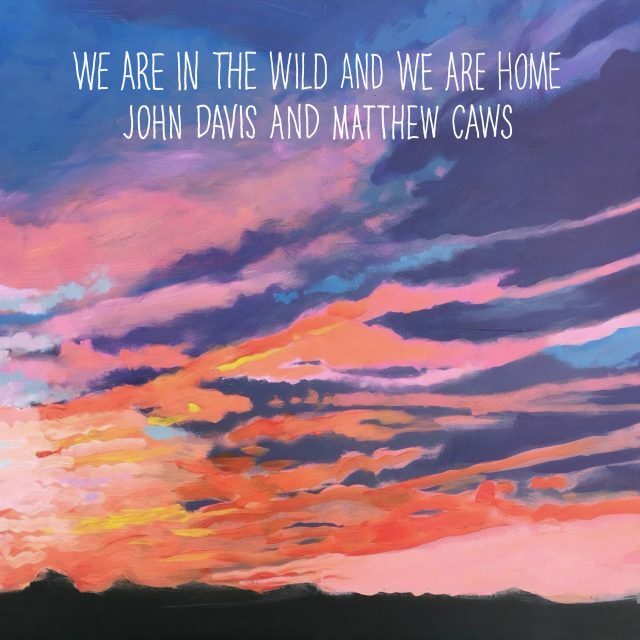 Matthew has a new single, We are Into the Wild and We are Home". produced with John Davis of Superdrag. Go enjoy that! And take a listen to my new album "Two Sides"
And the new Danny Hauger album is out! BRAND NEW Danny Hauger album Two Sides with 28 original acoustic, indie, and alternative rock songs! or stream me on Spotify! We are launching a brand new channel - Inspiring Teachers! We are providing weekly interviews and teaching tips on YouTube and Podbean, and invite you to join and listen to some amazing educators from around the country! In our new show, Tavis Beem and Danny Hauger discuss the “why” of teaching. Through interviews, empowering stories, current events, and teachable moments, Beem and Hauger bring inspiring stories from the classroom to the show. In this special preview, you will hear our Inspiring Teachers Show interview with Michelle Ferre from Pocketful of Primary (Support her on YouTube and TeachersPayTeachers). We discuss how teachers can inspire students to be themselves, and make an impact on the world. You can now subscribe to Inspiring Teachers on iTunes. Subscribers here have access to watch this episode early on our new Inspiring Teachers YouTube Channel. Danny Hauger Free Music Podcasts will continue to produce awesome indie songs, every week! Plus, the new album, Two Sides, is coming to digital music stores everywhere January 2nd, 2019! Thanks for listening, liking, subscribing, and sharing our new Channel, and to Danny Hauger Music! Doris Burke has long been someone I admired not just for her broadcasting gifts and abilities, but her tenacity and drive for success. I find myself similar in many ways, the serious way of approaching work and career and driving to be the best that we can, while still valuing a sense of gratitude and authenticity. I was so appreciative that Doris carved out a few minutes to talk to my students and I am thrilled to bring you this interview. Doris is best known for her work as an NBA analyst for ESPN and has had a storied career in sports broadcasting. I hope you enjoy this podcast and subscribe for more content here on Danny Hauger Podcasts. We talk about the beginning of her career in broadcasting, her favorite NBA athlete to work with, advancing through broadcasting opportunities in New York, her role in the creation of voice overs for the NBA 2k18 video game, and her advice for young people and those seeking to be successful in broadcasting an in taking opportunities as they come in life. My students will love this motivation and I hope you will enjoy listening to it as well. On November 20th, 17th I had the chance to go and interview my former teacher and mentor Melba Pattillo Beals. Melba was my radio teacher at Dominican University of California, she was also Communications Department chair, and this interview features conversation about history, parenting, and loving yourself and others around you. In a year and a half at San Rafael, I was fortunate enough to gain a wider lens to focus my own perspective. I was taken back mentally to the college classroom above the library where we met twice a week. I hope you enjoy this conversation nearly as much as I did. It was really nice to sit and discuss philosophy and outlook on life with Melba. Melba inspired me to take a challenging road once and a while, and value myself along the road of life, even when you can't see what's coming around the corner. There were a lot of takeaway quotes from Melba, and I decided to highlight a few of the most motivating quotes with on screen caption. This interview is a touching part of my past and my future simultaneously. I think we all can gain some insights and perspective from Melba's wisdom. We discuss education, faith, and potential, among many other topics. Not just a conversation about Central High School in Little Rock, we discuss a wide range of topics and I found it both informative and entertaining. To me, Its a cross section of American history and humanity. It was a pleasure to get to spend so much time discussing the uplifting side of the human spirit. Thank you Melba! Download all episodes from the Hauger History Podcast at http://haugerhistory.podbean.com designed for Middle School Social Studies students. Support this free podcast and get in touch at www.dannyhauger.com for booking live events. On https://www.joepisapia.net/ there are dozens of creative projects and albums that your stamp has been left on. Where does Joe’s musical gene come from? If I had a paint mixer of influences, or a Mount Rushmore of musical me, I have Soul Asylum, Jim Croce, Guster, Nada Surf, and the Gin Blossoms. Who is on yours? I love all of your cover art, nightvision, Wake My heart, they are almost sand-like mosaics of pleasing tones. Where do the covers come from? “Guster on Ice” is one of my favorite DVDs, a live performance from Guster in Portland, Maine. What is the production like on a project like that? I played your song, “River Song” on Titan Radio at CSUF a lot, whenever my co-host would tell stories about camping, and I began to identify with a lot of your solo work then. What inspires you to write? What’s your recording and engineering philosophy with your music? Tell us about your Pledge Music campaign, you’ve got some amazing items and thank you’s available! I pledged today, in the hopes that my music is found by new artists, and I want to thank Joe for his influences on me and all of fans old and new! Thanks for listening! Please help me support my free music and interviews! Support my free music podcast on Patreon! Support my free music! Buy a song from Danny Hauger's new album, "Songs to Wake Up to"
Grab "Swan Dive","Together Now" or "If I Grow Up" album for just $1 (or free) on Bandcamp!! Pay what you want and help support my music! Visit my website! www.dannyhauger.com and share a download with a music lover in your life! Recorded on Titan Radio at Cal State Fullerton in 2009 by then General Manager Danny Hauger. Glen and Danny discuss Toad the Wet Sprocket, the Works Progress Administration, new music and old through changing systems and music industry evolution. Its a discussion of music, recording, approaches to performing, and life. Scott Johnson remains one of my favorite guitarists of all time, from one of my favorite bands, the Gin Blossoms. I would say that I listen to at least one Gin Blossoms song daily on my car ride, radio, Pandora, Spotify, or otherwise. They have been a part of my growing up, inspiration for my own music, and a timeline as I saw the song "29" seem very far away, and now I am living it. Thanks to Scott Johnson, who in 2009, took time to be a part of my Titan Radio interview series, and we talk about the brilliance of touring, recording, and persisting to create outstanding music through so many excellent albums. Enjoy! Guster is my heart band. I am and have been a forever fan of the group from the first time I watched the movie "Life as a House". It was right around the time I began exploring IMDB movie facts and kept seeing references to this band Guster. Then I found out that the soundtrack that kept me connected to the movie was all by the band. From that point on it seems my musical sphere of influence was permanently laden with Guster vibe. This year at the Fillmore in San Francisco we celebrated Valentine's Day with the best band around and it reminded me to "Keep it Together" and re-share this chat I had with Ryan Miller from Guster in 2009 when I was the General Manager of Titan Radio. Enjoy the show! Every once and a while I love to spotlight the influences who helped define Danny Hauger music! Help support my free podcast and music! Get my latest album, "Together Now" on iTunes now! Please enjoy and share my free music! Follow me on Twitter @DHXmusic or @DannyHauger and buy a song or the album, "Together Now" on iTunes, Amazon, and Google Play to help support my free music podcast! You will be glad you did - or at least I will. Thanks for listening, and please subscribe on iTunes to help keep this podcast running free and ad free! On June 3rd, the Festival of Arts Pageant of The Masters presented select media with a preview of the 80th celebration of art and creativity that is part of the very fabric of Orange County. The 2013 festivities will officially begin on opening night, June 21st, 2013. The exclusive preview showcased six of the famous tableauxs featuring live people in famous works of art, meetings and interviews with Festival creators, staff, and volunteers, and art on display from local creators. Enjoy some highlights of this preview night which certainly present an exciting sample of things to come at the 2013 Pageant of The Masters! The video includes an interview with David Rymer one of the painters for the larger displays that astounds audiences annually, also discussing his career and how he became involved with the event. This podcast features interviews and live sound from the event, and a slideshow with videos gives a glimpse into the wonder and creativity that is at the heart of The Pageant of the Masters. Also in the video are some some behind the scenes photos of the tireless make up and costume work by the many volunteers involved. Photos courtesy Danny Hauger and Ashley Salzmann. Enjoy the preview, tickets are available online here for the 2013 Festival of Arts Pageant of The Masters. Take a look out the complete 2013 Program! As one of the nation’s oldest and most highly acclaimed juried fine art shows, the Laguna Beach Festival of Arts has offered a breathtaking showcase for artists and art lovers for over 80 years. The Festival’s prestigious juried art show includes a wide variety of media such as paintings, photography, printmaking, sculpture, jewelry, hand crafted wood and furniture, ceramics, glass and more – all by 140 of Orange County’s finest artists. This is the place to find that perfect art treasure for your home or business. From late June through the end of August, the Festival of Arts opens its doors daily for visitors to not only enjoy the award-winning work of exhibited artists, but also demonstrations and art workshops, daily art tours, live music, special events, on-site restaurants and much more. Call 1-800-487-3378 for more details. Fans of live music, alternative rock, and the marvelous songwriting of Glen Phillips will have an evening to remember on March 7th at Belly Up in Solana Beach, California! What a great time to re-post my interview with front man and innovative writer Glen Phillips and offer the opportunity for a great show at the historical Belly Up! Some great names along with up and coming acts on their calendar. There is a wide range of genres for music lovers of all kinds. Two particular shows have prompted me to finally get down the freeway to Solana Beach and review Belly U's tradition, acoustics, and overall vibe. I am looking forward to seeing a show at this historic house of music in Southern California. Something about Toad brings a pure sound, thoughtful lyrics, and a well constructed tempo that sings in harmony as well as any band from the style. The energy level flows through the audience for a thoroughly enjoyable concert that has a dynamic versatility lost to many bands today as the group transitions from upbeat rock to reflective ballads. Belly Up will be THE best place to be many nights of the year, and March 7th is no exception - when Toad the Wet Sprocket comes to town! More available from my podcast! Subscribe via iTunes! Another HUGE thrill on this Monday as I write, for just having been visiting the new Soul Asylum website to find that these guitar heroes from Minnesota are making their way to the west coast in 2013! So I will be assured to be found in Solana Beach once again on April 4th to hop onto that "Runaway Train"
much further into the rich tapestry of discography that is the Asylum. Everything from "String of Pearls" to the excellent new tunes of the past two albums including "Delayed Reaction" , lot of to love about this group! By the way (Dave Pirner tears it up live!) Be there! This is going to be one of the best Southern California rock shows of 2013, don't miss out! Honestly one of my favorite voices of all time, Tim Kitzrow, the voice over and announcer hero from NBA Jam, NFL Blitz, Wayne Gretzky's 3D Hockey, and dozens more video games from the arcade and home consoles. My audio here graciously takes time for an interview with me in February of 2012. Tim recently has re-released his "on fire" audio specialties with thousands of brilliant lines in the new NBA Jam: On Fire Edition that is downloadable on your next-generation system at home. From MLB Slugfest through NFL Blitz & NBA Jam, few people have been more notable voices in sports entertainment, and it is a pleasure to bring you this interview courtesy of Tim Kitzrow. Tim took time to visit with me on Wednesday, February 15th, 2012, to talk the genesis of NBA Jam with Mark Turmel, the recording process, writing for video games, and the classics we grew up with and continue to enjoy today. With that - the Boomshakalaka man himself, Tim Kitzrow. For more interviews visit www.mediadanny.com Everyone enjoys saving money while they shop online. With new sites popping up all the time for finding deals, some stand out above the competition. Fair and honest dealings are dealt daily at DealDash where you can find just about everything you could ever imagine up for auctions that you can depend on. Users understand the process of making a shopping and bidding experience enjoyable and trustworthy. Being able to shop confidently around the auctions is crucial to the design and functionality of the website. There are thousands of great deals with thorough descriptions and lots of photos to navigate before clicking on that decision to bid. If you miss an item, another one could be right around the corner. The site is designed to be easy to access and you could easily find yourself amazed by the quality and quantity of the items that are up for auction on DealDash. See for yourself today, you can have an account in moments or browse through as a guest to see how many unique options there are for you to add to your collection or start one altogether. The options are countless on the site and everything is handled very well by DealDash. Danny Hauger (Twitter, Radio Host) interviewed by Ken Kellogg. Recorded live in Santa Ana, CA at KWVE studios 107.9 FM with Ken Kellogg on the Update Program discussing the good work of The Salvation Army's Adult Rehabilitation Center in Anaheim (Facebook, Twitter). Enjoy this interview from 09-2012 and learn more about where your donations go, and who benefits from the efficient charitable work of The Salvation Army in Orange County of California, and around the country. To schedule your own home pick-up for FREE, call 1-800-SA TRUCK (1-800-728-7825). Your donations matter! Thanks for supporting The Salvation Army! Thanks to Ken and KWVE 107.9 for this wonderful community focused outlet. Pain sufferers all too often find little relief from products that fall short, but this is not the case with Nopalea. You know you will find a company that wants to help you when you are able tot ry something for free. Finding the relief for your pain may be as simple as calling a 1-800 number to get your own free sample and find out why so many people are finding relief from inflammation and getting the relief they have been seeking for so long. If you know someone in pain it is good to find an all natural solution like Nopalea. The pain caused by inflammation can be debilitating. People that suffer from diseases need help, and side effects from conditions life diabetes require care. Try an all natural solution that you can get for free. For the cost of shipping you can try this product. Reduce the inflammation and watch as the pain is reduced and comfort is restored. Get back to living your life today and find out why so many people are finding an all natural source of relief for their pain and discomfort. I hope you find your solution and start to feel better very soon. Don't forget to add music to your like, maybe even mine!